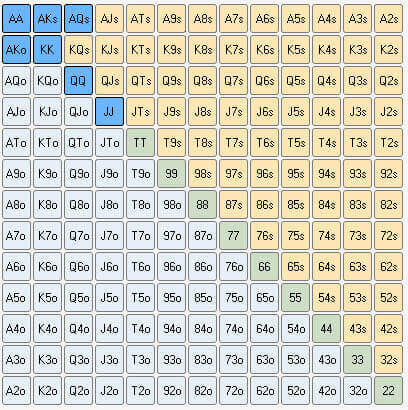 For beginners, 3-betting can be a confusing concept to understand and properly apply at the poker tables. With so much theory being discussed in books, forums, and training videos its easy for beginners to get lost in a fog of poker haze, not knowing when to 3-bet, what range of hands to 3-bet and why. The purpose of this article is to provide a basic framework that beginning and struggling poker players can use to effectively 3-bet. What Is The Pre-Flop 3-Bet? First off, lets level set what a pre-flop 3-bet is. A 3-bet occurs when someone open-raises and another person re-raises pre-flop. The re-raise is a 3-bet. This might be a bit confusing to some people because the 3-bet is the second raise, why is this? Well, in Texas Holdem the posted blinds are considered the first bet, the initial open raise is considered the second bet, and the re-raise is therefore the third bet, hence the term 3-bet. A linear 3-betting range is one composed solely of value-bets. When we 3-bet a linear range, we are 3-betting for value. For example, the image below shows a linear value 3-betting range of JJ+, AQs+, AKo. A polarized 3-betting range is one composed of a combination of value hands and bluffs. So, unlike the linear 3-betting range, when we 3-bet a polarized range, we are sometimes betting for value and other times bluffing. 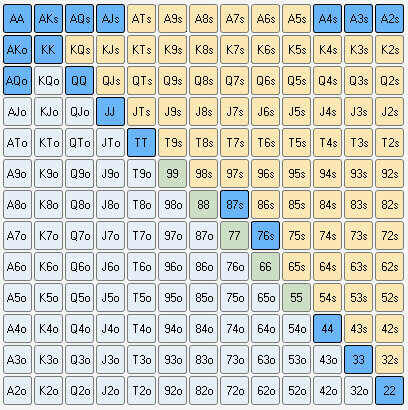 The below image shows a polarized 3-betting range composed of value hands and bluff hands. In this example, we are 3-betting TT+, AJs+, AQ+ for value and 44-22, A4s-A2s, 87s, 76s as a bluff. If we have a hand that fits within these two different reasons, then we have a hand we can “potentially” 3-bet. So which should you use, the linear or polarized 3-betting model? It depends on our opponents. You probably heard the phrase, “never bluff the calling station”. Well the same goes for 3-bets. You should only apply the polarized 3-betting model with 3-bet bluffs if your opponent(s) are folding to a lot of 3-bets. If they aren’t, then 3-bet bluffing will only cause you to unnecessarily spew off a lot of chips pre-flop. Conversely, if your opponent(s) are folding to a high frequency of 3-bets, approximately 67% then you can 3-bet bluff profitably. Therefore, 3-bet bluffing and the polarized 3-betting model works best when you have a lot of fold equity. When your fold equity is low, don’t apply this model and stick with the linear 3-betting model. How Wide Should We Value 3-Bet Bet? Again, this is dependent upon how your opponent(s) are reacting to 3-bets. When you are 3-betting for value, the most important factor is your opponent’s 3-bet calling range and 4-betting range. When you are 3-betting for value, you goal is to maximize your long-term expectation in the hand by having your opponents call your 3-bet with worse hands. For example, if your opponent is folding to 100% of 3-bets (this isn’t really realistic but proves a point), then it does you no good to 3-bet KK or AA. Against this specific opponent it is more profitable to flat his or her pre-flop raise. Conversely, if your opponent is folding to next to no 3-bets, then it is highly profitable to 3-bet a very wide range for value! Therefore, if you have high fold equity you should employ the polarized model. If you have low fold equity, use the linear 3-betting model. When sizing your 3-bets, I recommend beginner start with the 3x rule: raise three times your opponents initial open raise sizing. When you are out of position to the raiser, make your sizing a bit more, closer to 3.5x. Why? Our positional disadvantage in the hand. When you are in position to the raiser, make you sizing a bit less, closer to 2.8x. Why? Our positional advantage in the hand. This short poker strategy article on 3-betting 101 covered the basics behind 3-betting and linear versus polarized 3-betting ranges. While this article is far from being a comprehensive 3-betting strategy guide, it should help guide beginners in the right direction with their 3-betting game. For a more comprehensive overview of 3-betting, be sure to watch our The Three-Betting 101 Course!